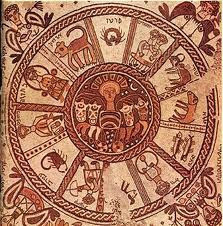 The Jewish Year is one whole, two halves, four quadrants, 12 months associated with 12 Tribes/12 Houses. 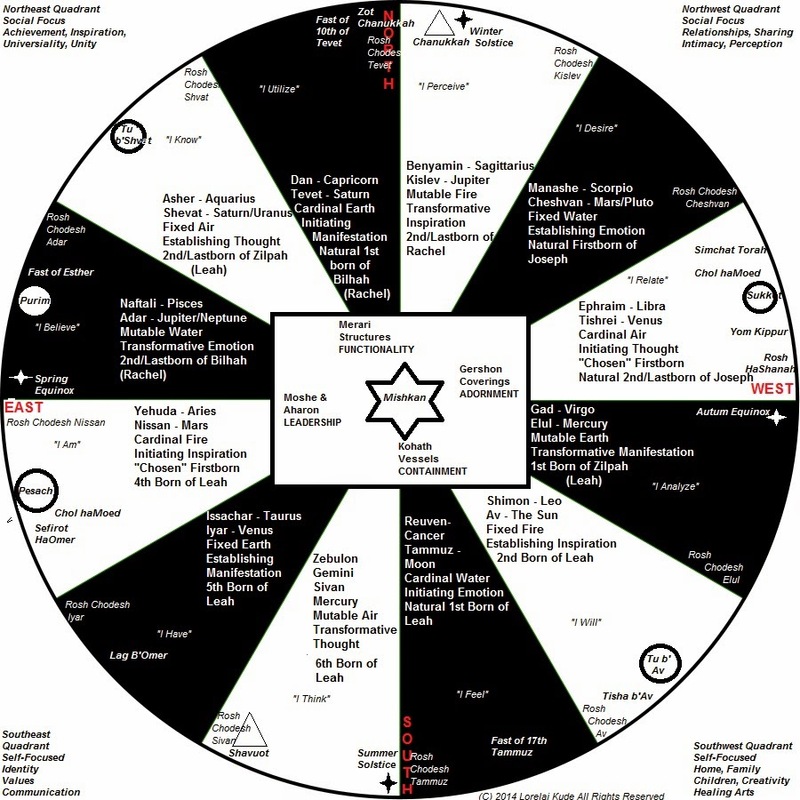 We've just rounded the corner into the Northwestern Quadrant - Libra, Scorpio, Sagittarius (Tishrei/Cheshvan/Kislev) corresponding to Ephraim, Menashe and Benyamin - "Rachel's Boys" (Ephraim and Menashe were the sons of Joseph, the son of Rachel, and this Quadrant of the year is the most intense "Rachel Energy" of the entire Jewish Year ). Each of the 4 Quadrants are made up of 3 Signs, always in the same progression: Cardinal (Initiating), Fixed (Establishing) and Mutable (Transforming). 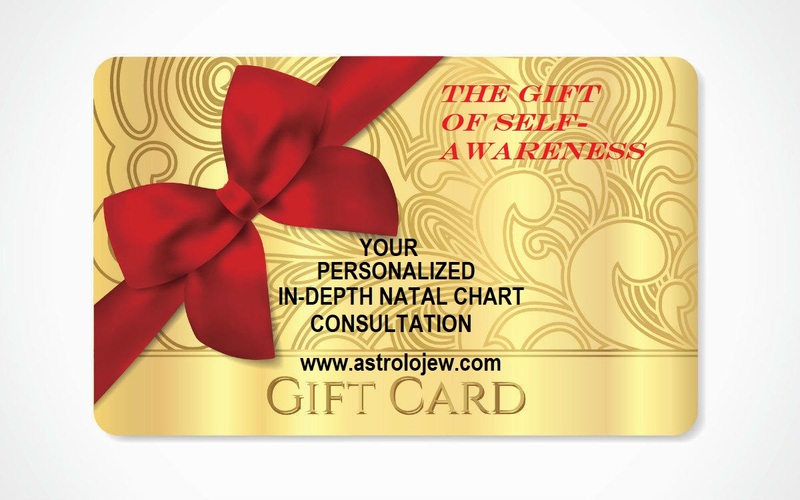 That is the archetype for all energetic progressions, internally and externally. It's Rosh Chodesh Cheshvan today. Fixed Water - Establishing Emotion. We're going to spend the next month diving into the deepest, darkest depths of our feelings and if we do our work correctly, we'll emerge from this month like a pearl diver coming up for air with the biggest, most pure and beautiful translucent pearl he found in the depths of the sea and the dregs of the bottom of the ocean. Cheshvan is sometimes called "Mar" (bitter) Cheshvan but we call it Ram (the highest!!) Cheshvan - for even though there are no holidays aside from Shabbat during this month, Ram Cheshvan is destined to become the highest when the 3rd Temple is inaugurated during this month as it is prophetically destined to happen - may it be soon! The Flood began and ended during Cheshvan, it's also the month of the yartzeit of Rachel Imanu and of Reb Shlomo Carlebach, who, like Rachel our Mother, constantly cried for the Children of Israel to return again, return again, return to the Land of our souls. 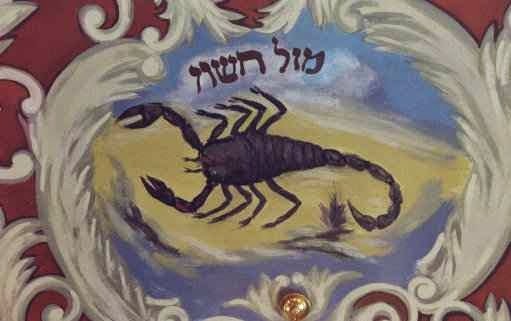 Cheshvan/Scorpio/Menashe is EXTREMELY INTENSE. Intensely emotional, intensely deep, as far from superficial as East is from West. We have the "klee", the container to be able to use this intensity right now for applied spiritual growth and the development of emotional wisdom. The "Rachel" Quadrant of the Jewish Year is about relationships. Tishri is about the marriage and partnership relationship, Cheshvan is about the sexual relationship and the relationships between ourselves and those with whom we share resources. Kislev is about sharing inspiration, sharing philosophies and ideas and religious constructs and ideologies. 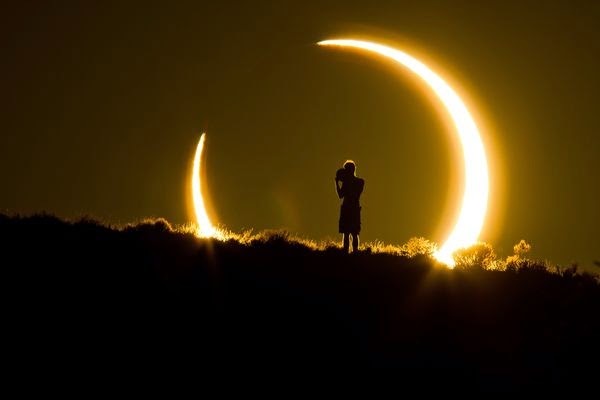 Rosh Chodesh Ram Cheshvan certainly got off with a big bang as we welcomed it with a New Moon/Solar Eclipse/Venus Conjunction yesterday, and on Saturday Mercury leaves his Retrograde period and will station Direct. On Sunday, Mars moves from fiery, inspirational (possibly fanatical) Sagittarius into practical and pragmatic Capricorn. It's going to be a week of energetic changes but it will feel "right", in fact it will feel more than right, it will feel right on time as well. We're going to dive deep - make sure your oxygen mask fits you correctly and you know how to use it! Beginning this Thursday, we're about spend the next five months experiencing a series of New Moons at Zero Degrees of each successive sign: Scorpio, Sagittarius, Capricorn, Aquarius, and culminating with Pisces. What's so special about Zero Degrees of any particular sign? It's a well-known astrological principle that "A Planet is not established in a Sign until it reaches One Degree". The clear archetype of Thursday's New Moon/Solar Eclipse at Zero Scorpio (2:57pm Pacific, 5:57pm Eastern, 12:57am Israel time on Friday) is the "Phoenix rising from the ashes" - rebirth and renewal of what has previously decayed and died. The fact that this happens at Zero Degrees of Scorpio is like a "clean sweep", a huge energy opening where everything is possible and nothing is impossible, a blank canvas, leaping over the chasm between 29 Libra and One Degree Scorpio without a net. Whatever House in your Natal Chart is ruled by Scorpio will be the most strongly affected by this Transit, and in fact it's the area in your life most likely to benefit from this radical rebirth and renewal opportunity. It's really an extraordinary opportunity to attempt the impossible, and to transcend previous disappointments, failures, and fears. It's a chance to get an eagles-eye view of your life and your situation - soaring overhead, looking down at the "big picture" instead of being trapped inside a perspective where you can't see the forest for the trees. On Facebook I wrote the other day: "This is a time of intense rebirth. This is a time to transcend all the limitations you've put on yourself. If you feel trapped or imprisoned, you now can see how your fears and incorrect beliefs about yourself have forged the chains you wear. Dissolve those fears and the chains will break as well. It's really an extraordinary opportunity for radical change. I invite you to take it." In each of the cases of the five New Moons at Zero Degrees, they ALL precede Rosh Chodesh of each successive month by mere hours (instead of up to a day or day and a half as in some years). The "Chodesh Energy" (the unique characteristics and attributes) of each of these months will be INTENSIFIED by the Zero Degree New Moon of each successive month. The way in which they will be intensified is the degree to which the expansive panoply of possibilities are each within the grasp of the particular individual. At Zero Degrees, it's "all bets are off," all the preconceived notions are thrown out the window and there's a tremendous capacity for FREEDOM from the past - FREEDOM from old habits - FREEDOM to make new choices. But only if you take the steps. Freedom requires movement on our part - we have to step into the Red Sea, so to speak, to be able to cross over to the other side.